Orsonally, Id rather use fresh garlic. Better taste and healthier. Thanks ..had a great laugh ..still laughing .. I ordered as ithink it may be good ..for me .. This ones even cheaper... …This ones even cheaper... https://www.amazon.co.uk/Tongmaster-Minced-Garlic-Granules-500/dp/B00A5ZGJDW/ref=pd_sim_325_5?_encoding=UTF8&psc=1&refRID=CM4DK3WBBV8E0FQAGHVSOrsonally, Id rather use fresh garlic. Better taste and healthier. 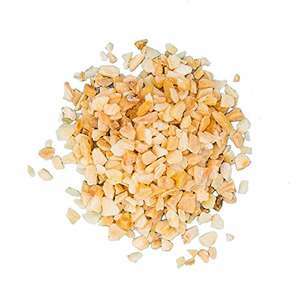 I use frozen from ethnic shops, but dried garlic from ethnic shops is also much cheaper, not a patch on frozen, which is also not as good as fresh, but a lot closer. It'll keep the takeaway delivery drivers away. £10.90 for ½ kilo of garlic? Dracula coming round for dinner?